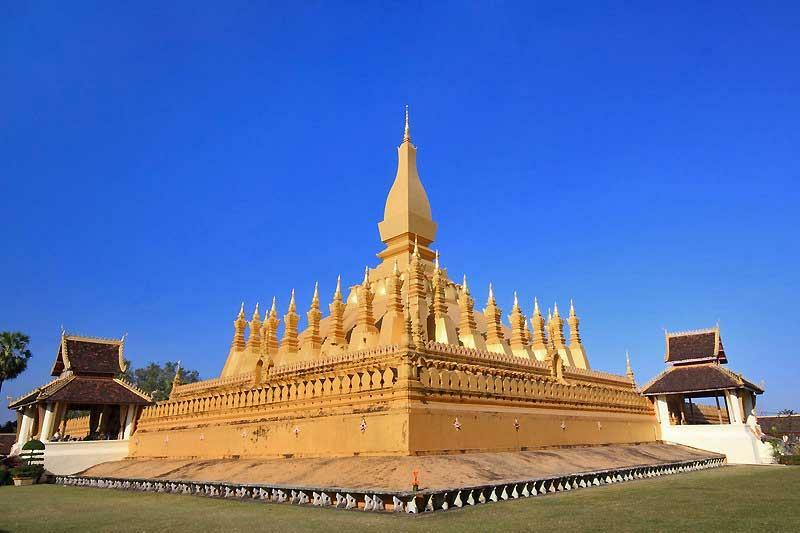 The Golden Temple or Pha That Luang or Great Stupa is the most popular attraction for those who visit Vientiane. Tourists and locals alike flock to the Golden Temple. King Setthathirath constructed the temple in 1566. It’s become the national symbol of Laos. A statue of King Setthathirath sits in the square before the temple. 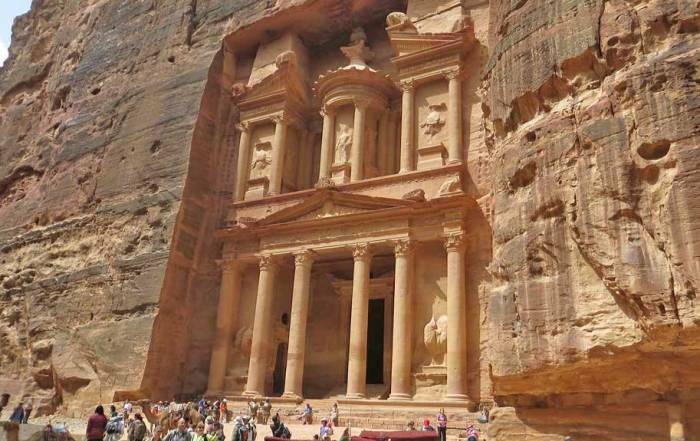 The Golden Temple isn’t the only thing to see at the site. The Wat That Luang Neua Buddhist Monastery has two impressive buildings facing the Golden Temple. On the opposite side of the Golden Temple, the Vat That Luang Tai Temple is tucked up close to it. 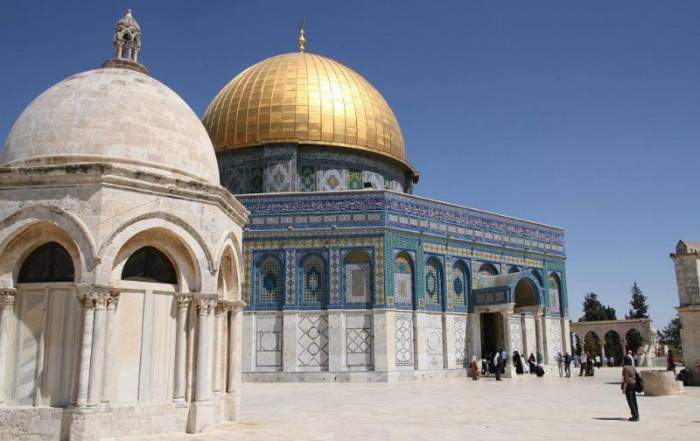 After your Golden Temple stop, it’s a 15 minute drive to the Presidential Palace. Stop at the half way point to see the Patuxai Victory Monument. You can climb to the top of the Victory Monument for views over the city. The Lao people built the Victory Monument to commemorate their independence from the French. Ironically the Victory Monument looks a lot like the Arc de Trimphe in Paris, but it has archways on 4 sides. If you time your tour for the morning, you can also stop on the way to see the Talat Sao Morning Market. 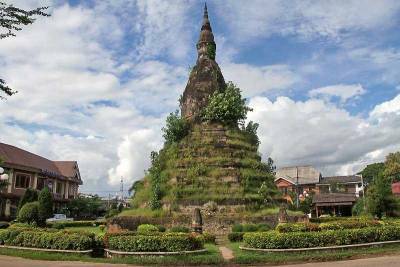 Many tours drive also past the ruins of the That Dam Black Stupa too, because it’s just one block off the street leading from the Golden Temple to the Presidential Palace. 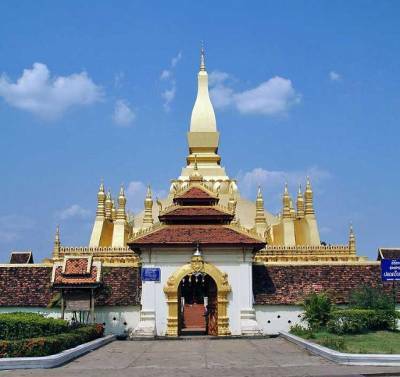 The Presidential Palace is downtown neart he Mekong Riverside Park, which borders the Mekong River. 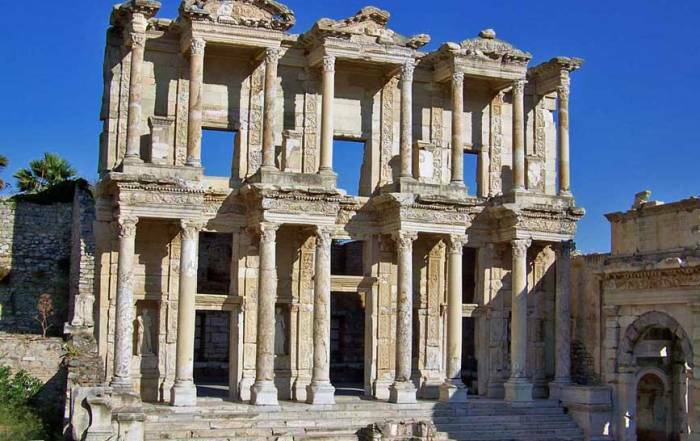 This palace isn’t open to the public but is an interesting drive by at night. 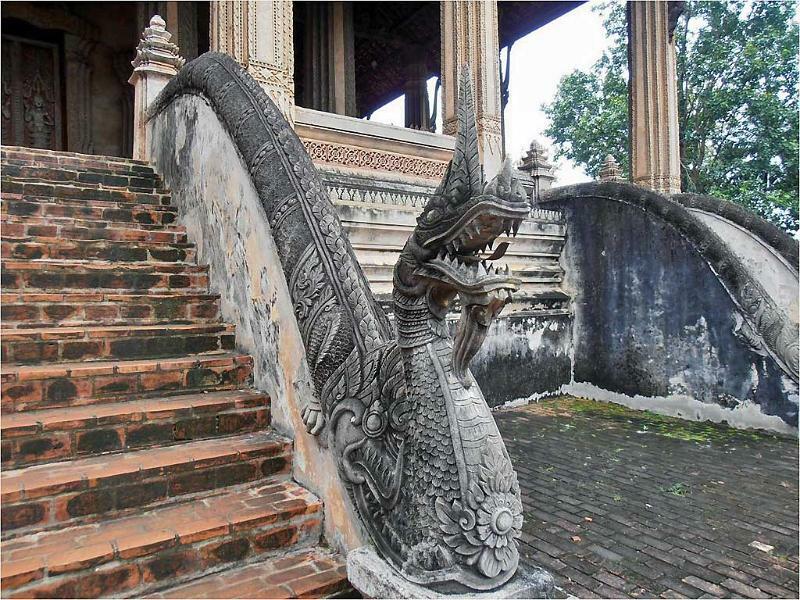 The Presidential Palace is the former site of the Lao Royal Palace, which was destroyed by the Siamese. 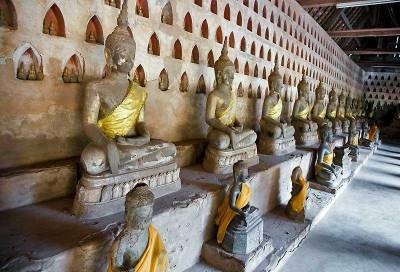 Within one block of the Presidential Palace you can also visit the Si Saket Buddhist Temple, the Haw Phra Kaew museum monastery and the Wat Si Muang temple. The Wat Si Muang temple sits on the ruins of a Khmer Hindu shrine and has a statue of King Sisavang Vong out front. The Mekong Riverside Promenade has become a popular hang out in the evenings. The Mekong Riverside Promenade starts at the far western edge of the Mekong Riverside Park.That’s Thailand on the opposite bank of the Mekong River, if you can catch a glimpse of the river. 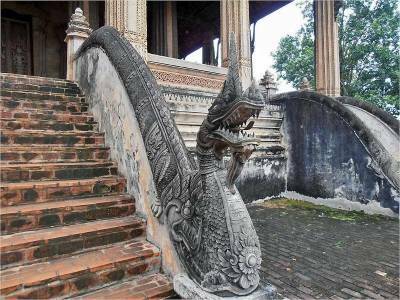 The Wat Chanthaboury temple is directly beside the Mekong River Promenade. 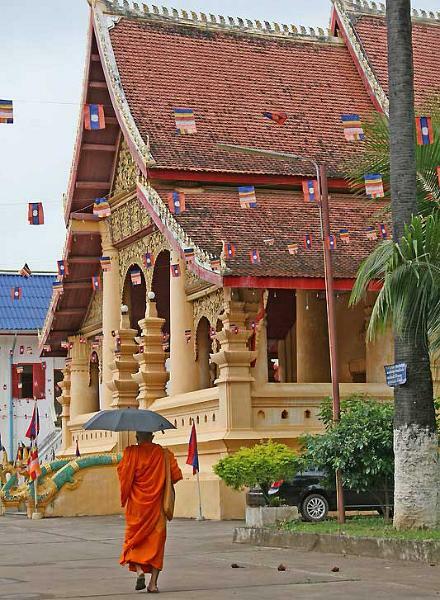 Walk just over a block to see the Wat Ong Teu Buddhist Monastery. 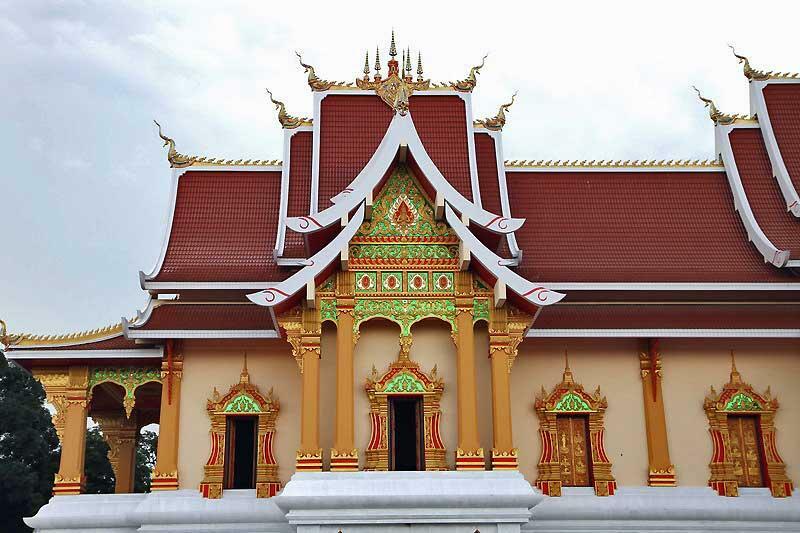 Also consider seeing the Lao National Museum when you are in this area. 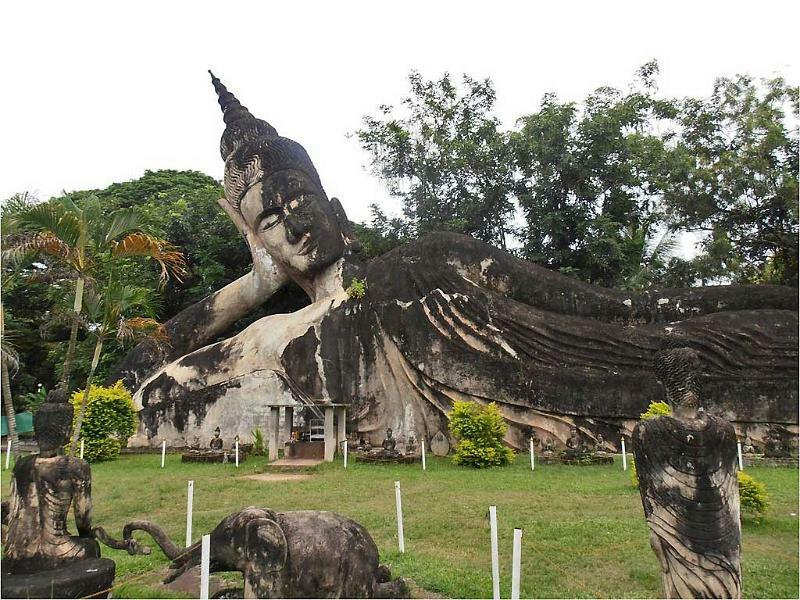 The Buddha Park or Xiang Khouan has become one of the most popular attractions for tourists who visit Vientiane. 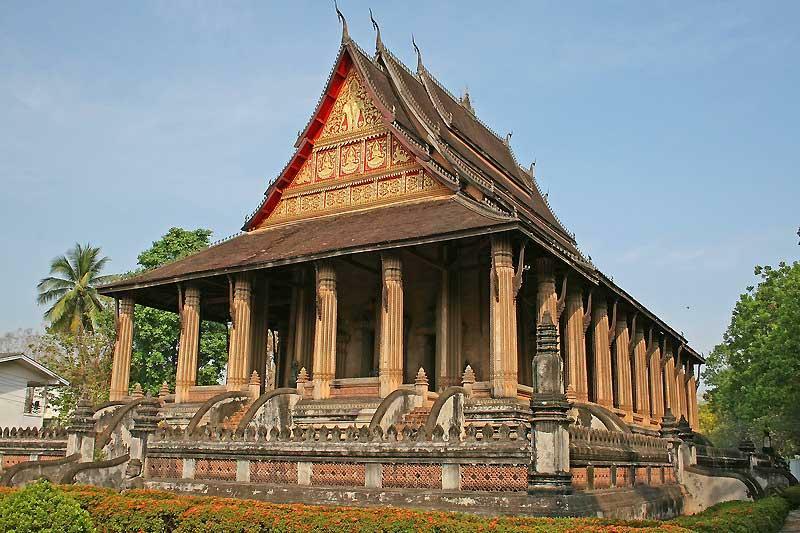 The park is about 15 miles south of Vientiane along the Mekong River. The Buddha park isn’t a ruin even though it looks like one. The park was built in the late 1950s. 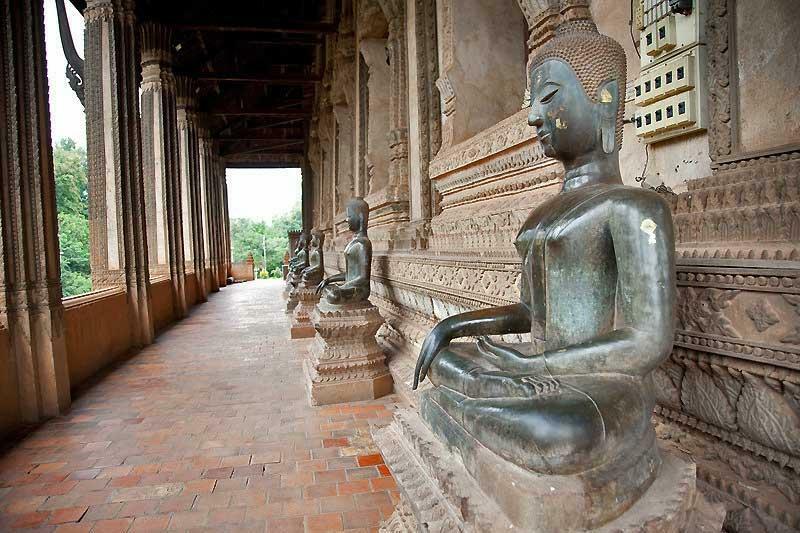 It contains concrete Buddhist and Hindu sculptures set among its gardens. The Reclining Buddha at the Buddha Park looks authentic and that seems to be enough to make it an extremely popular site. Cross the Friendship Bridge to Thailand. The bridge over the Mekong is just over 10 miles from Vientiane. The Friendship Bridge crosses to the city of Mong Khai in Thailand. A traffic light at the border in Laos changes traffic from right hand drive to left hand drive for the crossing into Thailand. The COPE Visitor Center addresses the issue of unexploded land mines and ordinance (UXO). 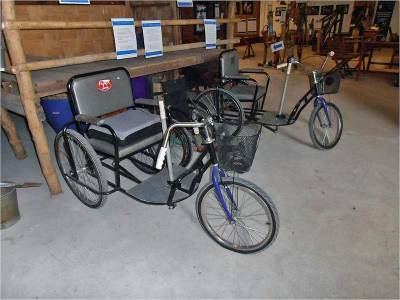 You will see hand-powered bicycles in Vientiane, which are used by victims of exploded land mines. Pay to have a bird released from a cage. Don’t think of the release as a humanitarian effort though. Birds are captured regularly to support this tourist business. Rent a bike for dollars a day. Most travelers get to Vientiane on an organized tour. People arrive by air, bus, rail and even local river cruises. 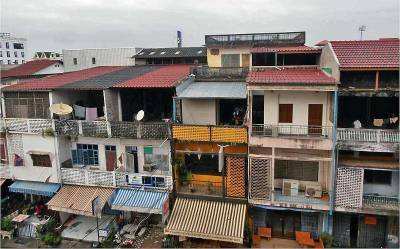 Flights arrive from Bangkok and Hanoi. 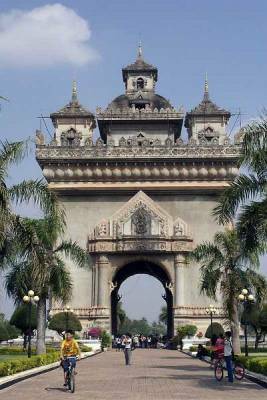 The Wattay International Airport (VTE) is at the city limits of Vientiane, so the cab ride downtown will take about 15 minutes. Rail passengers can arrive from Bangkok. Another common way to get to Vientiane is on a bus from Luang Prabang. The bus ride is a long challenging day trip. 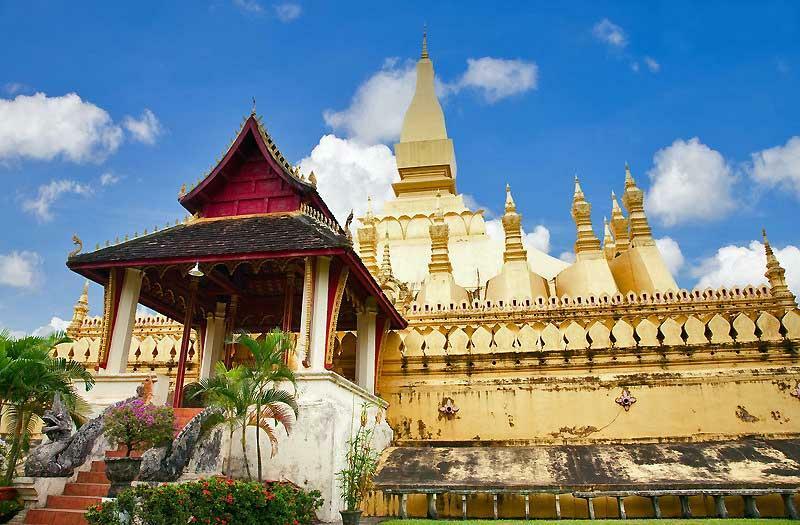 No railway systems connect the cities in Laos, so you will need to rely on cars and buses after you arrive. 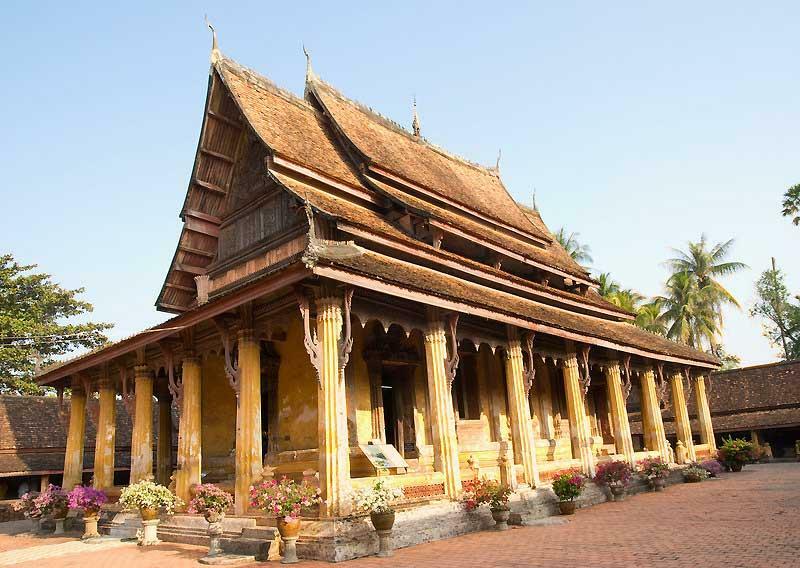 Several small river cruise companies offer multi-day Mekong River cruises between Vientiane and Luang Prabang. The Vientiane weather is very warm and humid. Average temperatures peak from March to May at around 91 F (33 C), while average lows are 75 F (24 C). The monsoon season starts in April. The monsoon season moderates the high temperatures down a couple degrees, but average lows remain at 75 F (24 C). Rainfall in the monsoon season peaks in August when up to 13 inches (330 mm) can be expected. 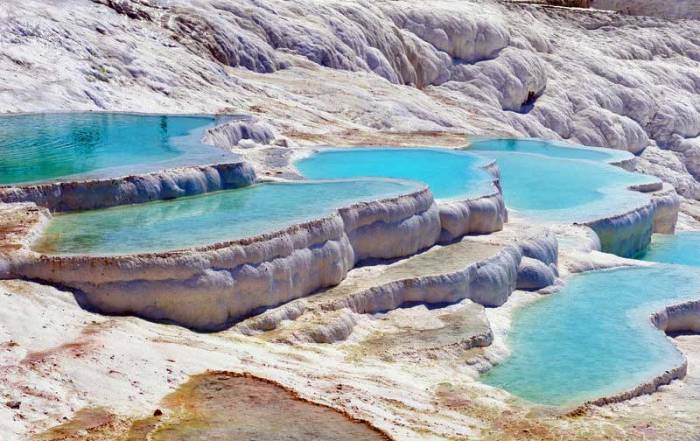 In the dry season from November to March, there is almost no precipitation. 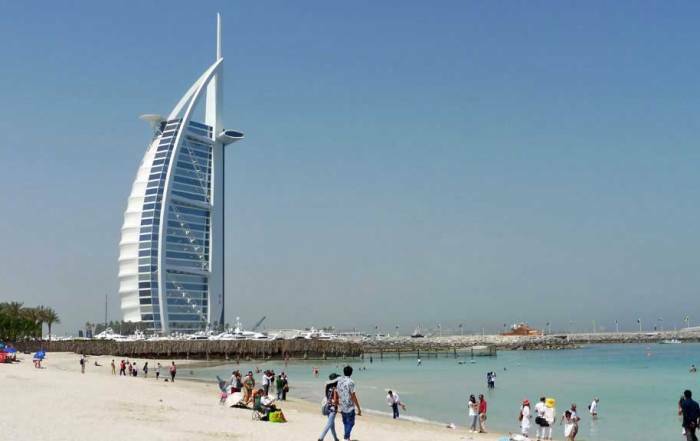 Expect average highs then of 83 F (29 C) and average lows of 65 F (19 C). 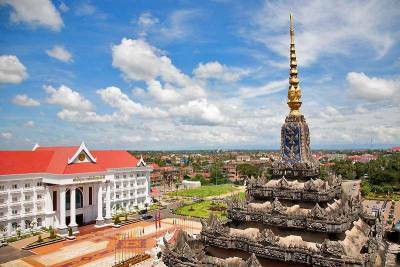 December and January are likely the best months to visit Vientiane for good weather. 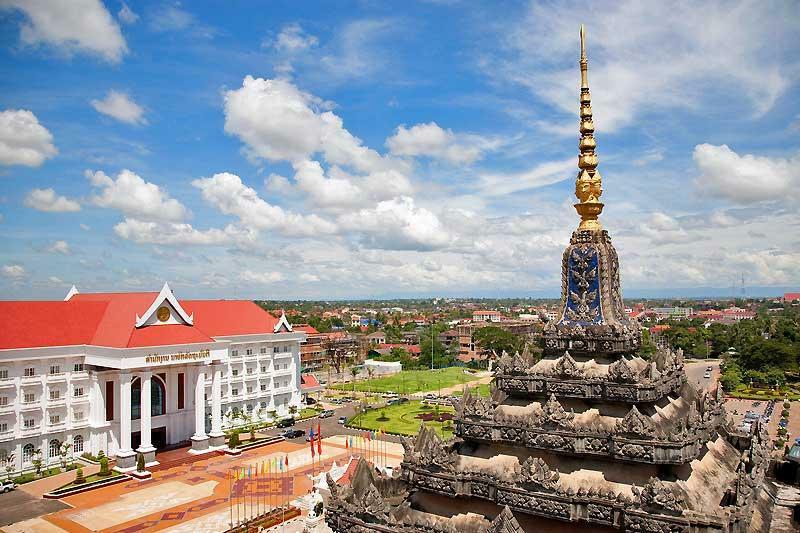 Vientiane is the capital of Laos and its largest city. 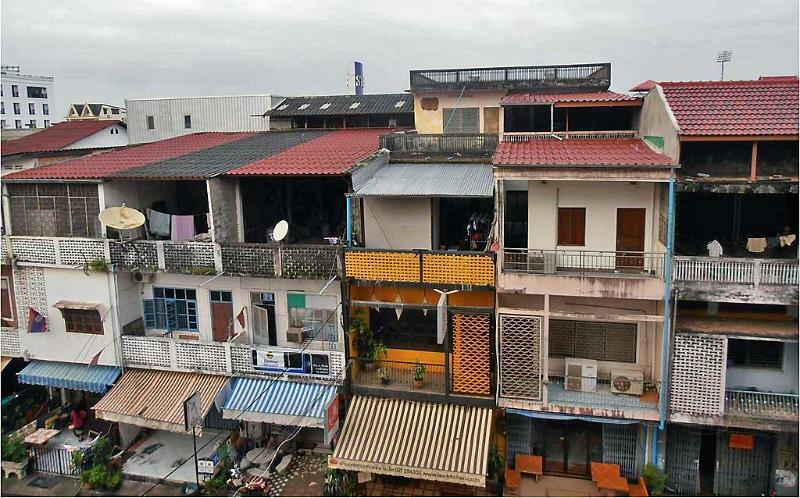 More than 750,000 people live in Vientiane. The city is on the Mekong River, downstream from Luang Prabang. 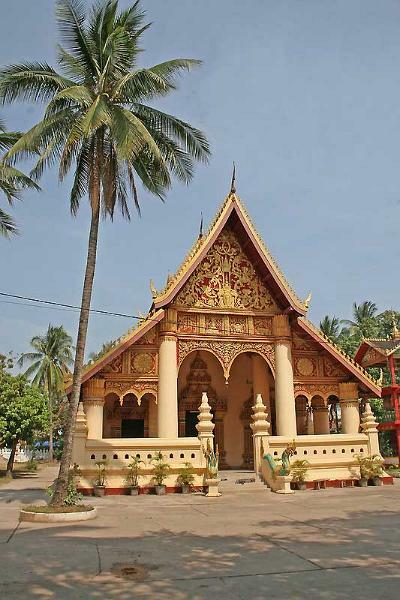 The Lao people likely came to this area from China in the 11th century and displaced the Khmer. The Siamese burned Vientiane to the ground after looting the city in 1827. After that, Vientiane has also been controlled by the French, Japanese and then the Americans. The temples of Pha That Luang and Haw Phra Kaew were rebuilt by the French.